Coming, as I do, from the wilds of West Belfast, I have an aversion to the Norn Irish accent on film and television; for me, there’s something distinctly cringe-worthy about it, a fact that is probably best exemplified every time Liam Neeson opens his mouth (who would have thought Oskar Schindler was, actually, originally from Ballymena? Or that Jedi Master Qui-Gon Jinn might hail from the planet of Countyantrim?). Strangely, though, the same aversion doesn’t apply to the written word, so I find myself putting on my broadest Belfaaawst and enjoying the likes of Jason Johnson’s beautiful Woundlicker or Stuart Neville’s dark and wonderful The Twelve. 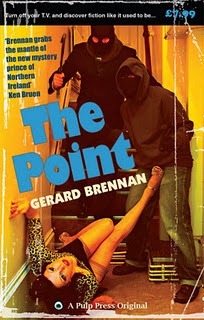 So it was in that frame of mind that I picked up Gerard Brennan’s The Point and, as the locals might have it, got stuck in. Paul Morgan is a small-time crook who has a habit of getting brother Brian involved in his schemes. When Paul is caught trying to steal from local hoodlum Mad Mickey, he is given a week to get out of Belfast. Choosing seaside town Warrenpoint – The Point of the title – Paul and Brian embark on one last series of jobs, breaking into student digs in an attempt to raise some cash. Upon arriving in The Point, Brian promptly meets, and falls in love with, Rachel, a girl with some psychotic tendencies. He gets a steady job, and gets ready to settle down, while Paul finds the local underworld and gets involved with the local big man who immediately gives him a job stealing cars to order. As Paul’s inability to stay out of trouble once again comes to the fore, things spiral out of control and the brothers find themselves in their tightest spot yet with no clear means of escape. Brennan does an excellent job showing us the decaying relationship between these two brothers – the one who needs to be constantly in the thick of things, always on the run from somebody; the other who wants no involvement, but is unable to help himself when his brother is in trouble. It’s the classic noir tale of how the introduction of a woman can drastically alter the landscape of a close male relationship – be it best friends or brothers – relocated to modern day Northern Ireland and peopled by a cast of believable – if not always likeable – characters. There’s a dark humour running throughout the book, and it is easy to forget that this is, after all, noir. The parting shot is all the more shocking in light of the humour that has gone before and is handled with a confidence that marks Brennan, a relative newcomer to the scene, as one to watch in the future. The packaging of this story is nothing less than perfect. Pulp Press have produced a small paperback of a size and style with the old 50s pulp paperbacks. The £7.99 price point might seem a little high for such a short piece, but the story is definitely worth every penny. Northern Irish slang abounds, but shouldn’t cause too much difficulty, but keep Google handy just in case. Short, sharp and shocking, The Point is Northern Irish noir at its best – dark, funny, gritty and, most of all, believable – and a fitting homage to the works of Jim Thompson, Patricia Highsmith and the swathes of others who defined the genre in the early-to-mid-20th century. Thanks a million for this, Matt! I’ve read Woundlicker and Alina. Loved them both. I really wish Johnson would write more fiction. Unfortunately, I interviewed him once on my blog a few years ago and he had no plans to do so. And comparing me to Thompson and Highsmith…? That’s going on my CV. I’ve yet to read Alina, though I keep meaning to do so. I just loved the premise of the first book, and the language he used was fantastic. Great job on The Point. I’m really looking forward to your Blasted Heath tale later in the year. Alina is quite different (multi-POVs and some slightly experimental stuff) but it was definitely still a wnner in my book. Same darkness and addictive language.